IBEW Local 953 awards five $500 scholarships to children of our members as well as recommends a candidate for the CVTC Foundation scholarship. To apply simply, print and complete the scholarship application form and return it to us with a 500 word essay on: "Why should I buy union-made, American products?" The scholarships awarded will be randomly drawn by the Executive Board at the annual meeting. Winners will be notified by mail. The essay is only an obligation to apply for the scholarship. Throughout the year, the essays will be published in the IBEW Local 953's newsletter. The scholarship applications drawing was held for 2018. The following are the winners of the $500 Local 953 Scholarships. Congratulations to all recipients! Chippewa Valley Technical College Foundation Scholarship is for students that are enrolled in the Electrical Power Distribution Program at CVTC. The CVTC teachers recommendation, along with IBEW Local Union 953's Executive Board, determine the best candidates in the spring of every year. The CVTC Foundation Scholarship 2018 Recipients are Ronald Shakal and Ethan Matz! 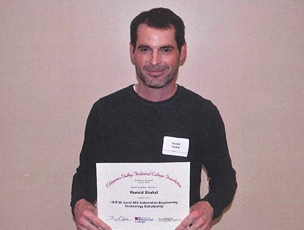 Recipient Ronald Shakal receiving the Automation Engineering Technology Scholarship.